It’s still early in the offseason, but all signs point to Giancarlo Stanton being the most prominent figure that could switch teams this winter. It’s not yet set in stone, but there are strong indications that the Miami Marlins will trade him. There are already several known suitors and several more who could become involved. There is already some indication regarding his most likely destinations. Here is an early look at each team’s odds of trading for Stanton this offseason. Within the first week of the offseason, the Cardinals appeared to be the favorites to land Stanton. There were reports that St. Louis was willing to offer some of their top pitching prospects, which intrigued the Marlins. Of course, while Miami may prefer to reach an agreement with the Cardinals, it’s not clear whether Stanton would approve a trade that lands him in St. Louis. The Red Sox have pulled back on some of the talk linking them to Stanton. But it’s clear that they are looking to add more power to their lineup. It’s also important to note that Boston isn’t afraid to go above the luxury tax threshold. When it comes to taking on all the money left on Stanton’s contract, the Red Sox may be a better fit than most teams. It’s been reported that San Francisco is looking to add a power hitter this winter. The Giants will likely target either Stanton or J.D. Martinez and would probably be satisfied with either one. Of course, while they may have the money to take on most of Stanton’s contract, the Giants don’t have a strong farm system, so putting together a package for the Marlins could be tricky. 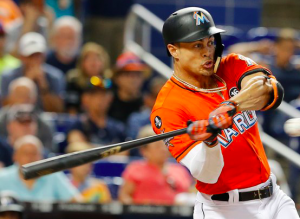 There’s nothing concrete to link the Phillies to Stanton at the moment, but there’s been plenty to indicate that Philly would like to make a splash this offseason. Trading for Stanton would certainly qualify as making a splash. The Phillies also have a deep farm system and should have some payroll flexibility, so it wouldn’t be surprising to see the Phillies start to become more involved. The Dodgers are determined to do anything and pay any price they need to win a World Series. Obviously, they aren’t far away after coming up just one game short in 2017. But bringing one of the game’s brightest stars to Los Angeles makes a great deal of sense. The Dodgers are also loaded with money and young talent, so if they want Stanton, they can make it happen. Again, putting Stanton in a market like New York makes a lot of sense. However, the Yankees haven’t been linked with Stanton this winter and they may not want his contract on their payroll. Nevertheless, they have the money and the young talent, so much like the Dodgers, they could trade for Stanton if they wanted to. It’s actually tough to find a lot of teams that could come out of nowhere to land Stanton. Trading for Stanton requires a special set of circumstances that not too many teams fit. It’s also important to note that many teams will be lining up their money to go after Bryce Harper and Manny Machado in free agency next season rather than trying to acquire Stanton. It seems inevitable that Stanton will be traded this offseason, but it’s important to remember that he has a full no-trade clause. If he doesn’t want to be traded, he doesn’t have to leave Miami. It makes sense for the Marlins to trade him, but that doesn’t guarantee it’s going to happen.